Sharpening your straight edge razors need not be a chore once you have read this guide. 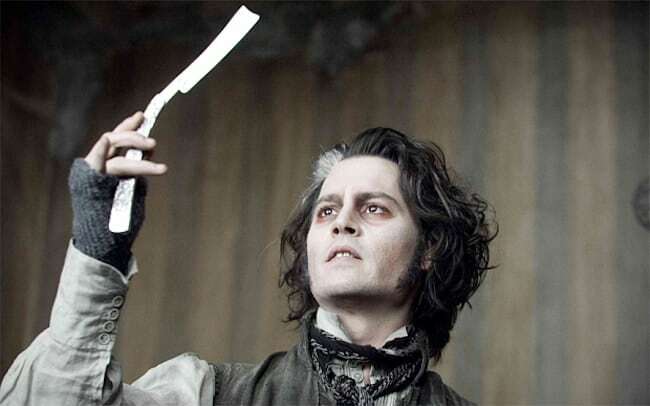 The fact is, shaving with straight edge razors is very much coming back in vogue. A lot of men are taking their skin care and shaving practices more seriously these days. Trends from the past coming full circle. Straight edge razors do need to be sharpened regularly. If you fail to do so, you could end up with painful, cut inducing razor experiences and even infection. It is worth bearing in mind that unlike any other blades we discuss here on Sharpen-up, razors are designed for the skin. When you think about that, it really does make sense that you take care in ensuring your razors are sharp enough to be safe. By sharpening your razor, you are essentially removing any nicks and damaged areas of the blade that could pierce the skin. Sharpening a straight edge razor involves the process of smoothing out the bevel, (ie the blade edge). There are a few quick and easy tests you can do to determine whether your straight edge razor is in need of a sharpen. One sure fire way is if the razor is starting to cause you irritation, or pulls hairs as you shave. This means the bevel has damaged ends and is snagging on your skin. It also means it is time to hone. Another way is to take a single plucked hair and slide it against the razor blade. A sharp straight edge razor will slice through the hair with ease. If your razor is dull, the hair will snag and tear rather than slice. Finally, you can slide the razor carefully across the top of one of your nails. If the razor scours a thin groove it is sharp; if however your blade fails to make a mark it is definitely dull. 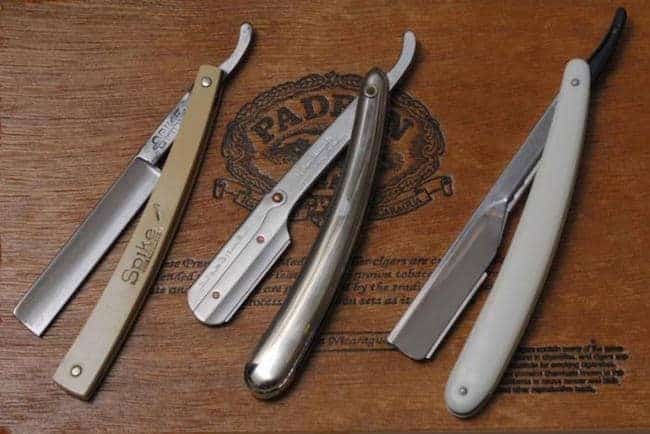 The most common way to sharpen a straight edge razor, and the way you will see in any gentleman’s barber should the proprietor be sharpening his tools in your presence, is by the use of a strop. If you take your facial grooming seriously, and have invested in a rather lovely straight edge razor, the strop should be the method you use for sharpening. 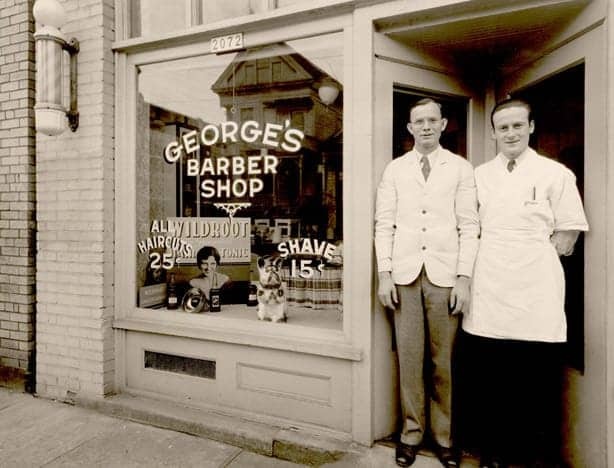 This way you are keeping up the authenticity of what it means to be a wet shave practitioner – (as well as properly taking care of your blade). Before you begin to sharpen your straight edge razor, you should clean the blade using a cotton ball and rubbing alcohol first. You do this by wiping it down on either side. Be careful not to cut your fingers while cleaning. Then, after wiping the razor dry, you can begin. If you are right handed, place the razor facing you in your right hand and the strop in your left. The razor strop and razor blade should make a 90 degree angle in front of you. Once you have both items at the correct angle, pull the blade down the full length of the strop using rapid strokes. After 10 strokes you should achieve the sharpness you require for a safe shave. However, nothing explains a process better than a well-produced video. See below on how to sharpen a straight edge razor. Follow these steps at least once a month and little bits of toilet paper attached to your face on the commute to work will be a thing of the past. If you’re looking for a high quality, real leather barber strop then look no further than this. The 30 Degree Red Leather Strop uses high quality grade latigo leather and has been cured for the perfect draw. Not only that, it looks fantastic. You know that scene at the beginning of The Untouchables where Capone is getting a wet shave? Well this is the kind of strop the barber would have had back at his shop, (if the movie were real life). 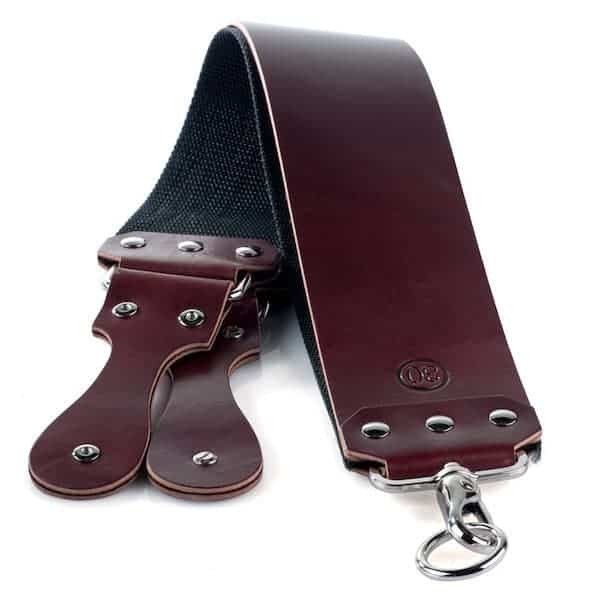 The main leather strop is accompanied by a twin strop made of webbed fabric that is used for polishing. This beautiful item is made in the USA, and currently has customers singing the deepest of praises. Check out prices and reviews on Amazon. Utilizing a sharpening stone is another way to sharpen your straight edge sharpener, and is almost as popular method as using a strop. The results are equally as good, and you will certainly be able to maintain your razor blade with ease using this approach. 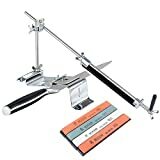 We have reviewed all manner of sharpening stones on this website, so if you need to buy one, you are in the right place for guidance. However, exactly how do you use one when it comes to razor blades? Well, let’s take a look. The great thing about using a stone to sharpen a straight edge razor is the fact you won’t have to do it as often as with a strop. In fact once every 3 to 6 months should suffice as long as you have got the technique sorted. 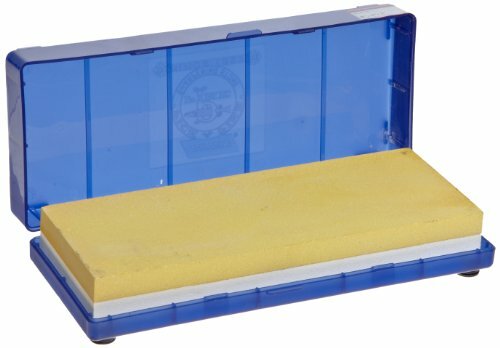 We recommend that you use a fine grit sharpening stone. The Japanese waterstones are ideal for the job, with the 4000 / 8000 combination grit whetstones suiting the task best of all. Pictured: The Norton 24336 Japanese-Style Combination Waterstone 4000/8000 Grit – highly recommended for sharpening straight edge razors. Start by putting the stone on a flat surface with a bit of space for you to manoeuvre. You should find with the razor flat above the stone, that your angle is already obtained. This is because most straight edge razors are hollow-ground, which essentially means they are formed into a concave shape when they are ground. With your razor lying flat, slide it across the stone evenly, leading with the blade heel. You should use slow, steady, light strokes across the stone, and be careful not to over sharpen. This blade is going to be used against your face after all. Also, avoid pressing hard as you sharpen as this can change the angle at which the blade is sharpened up, again ruining the blade and causing a potentially hazarded future shave for you. 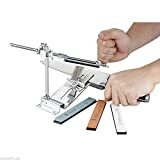 Again, as pictures say more than a thousand words and a video countless more than that – here for your viewing pleasure is a youtube video on exactly how to sharpen a straight edge razor using a sharpening stone.